The full-day tutorial on Wednesday, October 6th, open to all GDC Online pass-holders (excluding Game Career Seminar) also includes talks from key PlayStation Home execs, a developer panel including nDreams, Jet Set Games, Hellfire, and Codename execs, and an end-of-day mixer. - In addition to a GameSpy Technology developer day on Tuesday, October 5th -- with industry speakers to be confirmed in the near future -- the sponsored monetization track has rounded out its schedule with lectures from RockYou and from SuperRewards. As previously mentioned, Platinum Sponsor Playspan has the full line-up for its self-programmed lectures on the afternoon of October 7th, including Playfish co-founder Sebastian De Halleux, Turbine's Kate Paiz, Facebook's Deborah Liu, Adobe's Danielle Diebler, Yahoo! 's Kyle Laughlin, Nexon's Min Kim and more -- with a Monetization Track Mixer at the end of the day. - With a vibrant Expo floor, including an independent game showcase from IndiePub Games in place and several after-hours events still to be announced, the parties and networking opportunities at GDC Online are rounding out rapidly, with the GDC Online Opening Night Party already confirmed for Wednesday, October 6th from 7-10pm at Maggie Mae's, and sponsored by Unreal Engine creator Epic Games. Details on Tuesday and Thursday night open-to-all parties will follow, and the GDC Online networking page also details the iPhone Summit Mixer, sponsored by Aurora Feint, the 3D Stereoscopic Summit Mixer sponsored by Crytek, the Game Narrative Summit Mixer, sponsored by Writers Guild of America, and a hi5 Networking Mixer -- all providing key sector-specific networking. Finally, the GDC Online Awards on the evening of Thursday, October 7th also include a pre-awards networking reception. These vendor supported opportunities add to the plethora of sessions across four days at GDC Online. 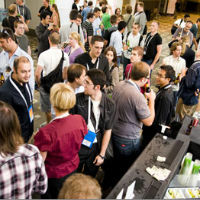 The event will take place October 5-8, 2010 at the Austin Convention Center in Austin, Texas, and to learn more about lectures across all tracks and summits for the event, for which registration is still open, please visit GDC Online's official website.